Its time for a rant, there are some cars which to me i dont care about or dont understand... yet other people dont stop banging on about them. The S3 looks better and is faster, no the V6 isnt torquier, why pay more for a slower and heavier car? The Boxster/Cayman... buy a second hand 996. Audi R8: It looks like a big TT, its a Gallardo in drag and not that much cheaper. *Prepares to get shot in the face... McLaren F1 it goes 250+MPH... and? Can't argue there. Also, I never understood the point of the S/RS lines. Don't see the point of 2 high performance variants. But I can see the point of the 335i. Edmunds.com recently ran an automatic 335i to 60 mph in 4.9 sec. That's the old E46 M3's time. A bit more money for a lot more content compared to the outgoing E46 330i. The normally aspirated 328i is plenty fast, but the 335i is just so much more entertaining. Mid-engined vs. rear engined. Some prefer the balance of a mid-engined car over a rear-engined car, in which case the Cayman makes perfect sense. The Boxster harks back to the old 356 Speedster days, so I say it remains a pure Porsche. The Cayenne SUV is utterly pointless except for the fact that it adds huge profits to Porsche's bottom line. So long as they use those profits to continue making excellent sports cars, I'm all for it. I also agree here. Don't like the styling and the overall car doesn't warrant its $100k pricetag. That's Aston-Martin territory. Anything in the Hummer lineup, completely pointless: original, H2, H3. Ssangyongs, just why do they bother? don't they realize how ugly there cars are? The Boxster and the Cayman in particular are far more concentrated as sportscars than the standard 996 ever was. They are also mid engined and are therefore much better balanced. The price bit is obvious, and can be made against almost all new cars, considering that there are second hand bargains lurking around everywhere. The McLaren F1 was something never seen before. Many people thinks that the goal of the F1 was to be the fastest ever roadcar, but it wasn't. What Gordon Murray, Ron Dennis and Peter Stevens set out to create was the ultimate drivers supercar, something, if you look more closely, it still is. The approach Murray had when he designed the F1 was unique, as he started with a clean sheet of paper and a driver, and then built everything around the driver. The F1's specifications was also as driver friendly as possible, he wanted a natuarlly aspirated engine for the best possible driveability and response, as turbocharging would make it rather unpredictable and laggy. But the really impressive thing was that in a car that fits into the "footprints" of a 993 Turbo or a tha same size as a Cayman is that says more; They managed to get seating for three occupants, their luggage, 90 litres of fuel and a 6-litre V12. Everything in the F1 is driver focused, and actually unlike most other mid-engined supercars the F1 is fairly practical as the visibility is good due to the central driving position, and fairly thin pillars. Tiff demonstrated all of it's practicallity very well on Top Gear, many years ago when it was new. The F1 is not just a brilliant supercar, it's also a masterpiece of design packaging. 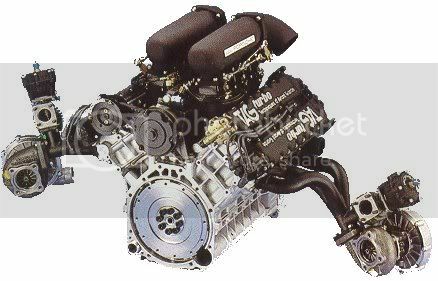 The McLaren F1 engine is nothing like the engine they had in the 8-series, or planned for the M8. It shares the number of cylinders but that's where the similarities stops. It was specially made for McLaren, and shares more with their straight sixes from the M3 and M5, than the S70 V12 from the 8-series. The planned M8 had a normal 8-series V12 engine with new DOHC 48v cylinder heads (Called S70/1), the F1-engine was a brand new construction from scratch loosely based on R&D from the E-34 M5 engine (Despite similar sounding names; S70/2 for the F1 and S70/3 for the LM) Looking at it you will se the heads and the block from the McLaren F1 engine looks like it has a lot in common with the straight six that later found it's way into the E36 M3. Let's take the short, short story from the start. The first manufactor McLaren did some developing with was Honda, they were to make a 450hp engine, based on F1 R&D. 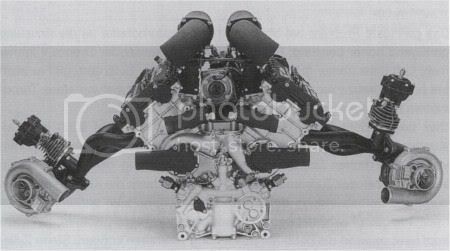 The reason why Murray asked Honda first was becuse he had worked with Honda delivering engines for the TAG McLaren F1 team after the turbo engines was banned (This was the turbo engine they used in their F1 car earlier, TTE P01; Tag Turbo Engines Porsche 01). But then the Bugatti EB110 and the Jaguar XJ220 came along, both with a hefty 100 hp more than planned for the F1, this seemed silly with a car that exspensive. So they demanded a 5,3-litre minimum and over 550hp, then Honda would need to develop a brand new engine from scratch, which was out of question. During the Hockenheim GP in 1990 Gordon Murray met his old mate Paul Rosche from when he worked with Brabham in F1 who asked him about how his supercar project was going, Murray answered that he was just missing an engine and time was starting to run out. Then Roshce invited Murray to Bayern to see the S70/1 from the M8-project. Murray made it clare once he saw it that it was much too big and far too heavy. So then Roshce said they'll make a new engine, and told Murray to instruct the M-Sport engineers closely about what he wanted from it. After three weeks Murrays demands from the engiene was clear, 550hp+ and 7500 rpm redline, no more than 250kg and for the love of god, no more than 600mm long. It also had to be stiff enough to serve as a stressed member, and it needed to be dry sumped. This was in November 1990, and by christmas 1991 the engine was ready. But it turned out to be 16 kg heavyer than Murrays demands, which he unexpectedly ignored because the engine was a lot more powerfull, 627hp, so it was it was in percentage twice as more powerfull than heavyer than Murrays original demands by a rate of 14 to 6,5 against. Last summer CAR had a supercar celebration feature with amongst lots of other features an interview of Gordon Murray, where he was asked what he would have done differently with the car if it would be made today. He's answer was that he couldn't think of enyting he would like to change if he would engineer it from scratch again today. I hope that cleaned it up regarding the F1 at least. I cannot understand and I cannot accept SUVs. No exception. They are all crap. From Land Rover to Toyota Rav4 and so on. Oh c'mon, they're not that bad. Oh wait, yes they are. But ugly cars sell. Just look at the cars from the Banglish Motor Werke lineup. SUVs might work in places like Norway, where half of the year, there CAN be trouble getting around in lets say a A4 Quattro because of lack of ride hight. In the middle of a city, it's pointless. And the Outlander drives as well as many normal cars. Uses too much petrol though, so I'd like the new Outlander. It just seems to be a great car. Cars I don't get? The first generation RAV4. You won't find a more horrible "new" car from the last decade. And I'm not joking. Toyota is one of the biggest car firms in the world, and their first midsize SUV is based on something that at the time (94, I think) was allready 6-7 years old. It was CRAP! Rode like it had no suspension in a straight line, in the bends it rolls like a kajak, the interior is better in Korean cars of the same timeline, the engine had less torque than a moped, was more asmathic than my asmathic friend, and I truely hated it. Actually nomax i agree all small/compact suv's. And back to the F1 i prefered the XJ220, the F1 is just bragging rights. Porsche Cheyenne. BMW 1 series. New new Mini. VW Fox. VW Golf R32. I mean who buys that? For that money you can buy a proper secondhand Subaru. The guy who wants something that's classy AND fast? The guy who loves to race BMW E36 325i-drivers at the lights? ... the F1 is just bragging rights. So, you somehow missed my rather lengthy explaination about it...? I liked the first one, the second one looks too tame. Nope i did read it, it is a technical masterpiece... but it still does nothing for me. I know i should love it, but i dont.... i dont know why. IMHO I don't get the cayman. Porsche makes the boxster which I don't like but okay I'm sure it is loads of fun to drive and they make the 911. Just like JC said it just seems like a way to manage the price gap. People who can't afford 911s buy Caymans. It's like you KNOW they can do better but they don't and that I can't stand that in a car company. I also don't get huge SUVs. I live in the US so we have alot of em and rarely anyone actually uses them for what they're intended for. They never off road or really fill up every square inch of cargo. They just take their kids to school, practice and get groceries. You can easily do that with a crossover, wagon or even some sedans. He mentioned in his evo column a couple months ago the same thing : that if he had the chance to remake the McLaren F1 today, he'd improve the lights and the brakes, and that's it. The (Euro) Ford Fusion. It's a Ford Fiesta...that's a tiny bit taller! The VW Golf Plus. It's a VW Golf...that's a tiny bit taller! and the BMW 3-Series coupe. You buy the coupe presumably as you don't need the two rear seats as much...so why not get a Z4 / Z4 roadster? Or if you do need them, get a normal 3 series. Supermini CCs, for example the Nissan Micra C+C. The only justifiable reason I can think of for buying one of these is if you like the looks, and can't afford a normal-sized one (such as a VW Eos, Vauxhall Astra TT etc). Money better spent on a hot version of the original supermini in question or a secondhand MX5. Convertible Rolls Royces and Bentleys confuse me. It's like adding an informal element to formal cars. Kinda like wearing a pair of Nikes with a tuxedo. I also don't get the Lotus Exige. After paying all that money for a car with nothing in it, it's really not much faster than more nicely equipped cars. Same goes for the 911 GT3 and 360/430 CS. "Hot" diesels. I just don't see the point in having hot hatch with a Diesel engine. Sure, you have the looks of a proper hot hatch, often with more power, acceleration and whatnot than the petrol version... but the moment you start the engine it all falls apart, because it sounds like a damn John Deere tractor. I just don't get it.